I have to admit, I tend to be weekend warrior when it comes to crafting. Between evening meetings and going to the gym, I'm usually pretty pooped in the evening and don't always feel like pulling something out and stitching away. However, if I'm organized, I can usually set aside a big block of time on the weekend to work away in my craft room. This weekend was spent working on some things for a swap and finishing my first punch needle project. I found this to be truly addicting! The Valdani floss is fairly expensive, but the variations in color provide a sense of "movement" in the design. Plus, if you're punching a large area (not sure if that's the correct terminology) you can just thread the needle and use the thread directly off the ball. Just be careful the ball doesn't get caught up somewhere or you'll end up pulling out stitches. I don't know of a nearby Valdani source--I have to drive about 40 minutes to the closest store I believe, but I did find an online retailer called Snowflake Memories that is having a pretty good sale right now so check them out if you get a chance. I also spent some time organizing my craft room. I try to put my wool back neatly after working on a project, but somehow it always ends up pretty jumbled and messy looking, so every few months I have to pull it all out and refold and stack it. Don't you feel better when everything is nice and tidy again? The goal is to get everything lined up just right to allow the doors to close. Success! I usually try to get my hours in at work between Monday and Thursday so I can run errands and catch up at home on Friday, but this week I had meetings at a couple of the schools we work with so that wasn't possible. And what a great day it was! We were able to make connections with Kansas City Community Gardens, which has a great school garden program. Andrea, who coordinates the program, brought out plants and seeds and worked with all the classes to plant the raised beds at the school. Here are photos from a couple of the kindergarten classes hard at work. Notice the winter coats. That's Kansas in the spring for you. It was a brisk 40 degrees but at least we didn't get the rain predicted. 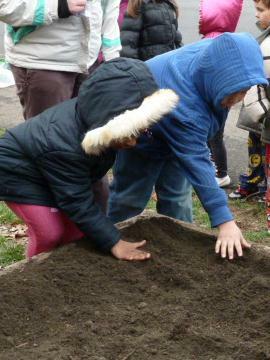 The kids planted broccoli, peas, carrots and cabbage; all plants that can take a little cold. I believe Andrea is overseeing the planting of 140 gardens at schools and hospitals, so we're glad the weather cooperated and we were able to complete the planting on Friday. I'm looking forward to checking back with the school and seeing how everything does! And for my find...my time on Fridays usually involves shopping, so I will try to include a photo of something unique that I come across on Friday. However, this week I found something else. I love reading and learning about our country's history, especially during the 1700's and 1800's when the country was expanding and becoming the United States. I arrived at the second school I was visiting in Kansas City, KS a little early, so I drove around the area a little and came upon this statue, which is now in the middle of a mostly residential area. As I mentioned, it was really cold so I didn't get out of my car, but next time in the area I'll check when the statue was commissioned. Kansas and Missouri were really in the thick of heated conflict during the Civil War and I think this statue certainly couldn't have sat well with our Missouri neighbors! Twice a year, the Platte City High School north of Kansas City is filled with wonderful antiques and the bustle of happy shoppers. We always get to the show early and anxiously wait in line for the doors to open. It's always a blessing when the spring weather cooperates because the wait can get quite chilly. Definitely worth it, though! The first thing that caught my eye were these cake plates from. I have my mother's little plate that held the first birthday cake for my sisters and me and the grandkids. Special memories, but I learned from Romney Savage Baker of Old Friends Antiques & Collectibles that the small plates were probably used to hold cheese! She also had this sweet display of toy irons. Loved all the gardening displays! Ignore the reflection in the glass but I liked this unique composition. How long do you think it took to make all those little yoyos for the urn? Someone had a lot of patience! 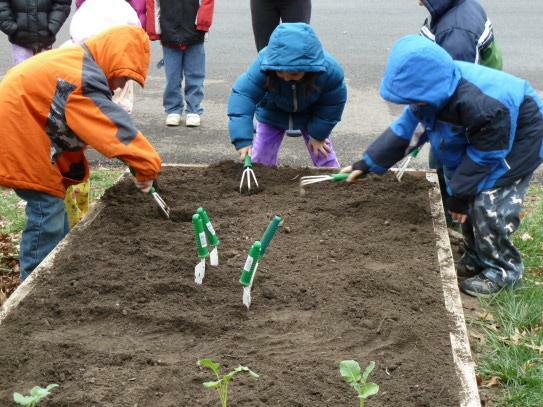 A great way to get inspired for the upcoming gardening season is going to this annual event held at Family Tree Nursery. The theme this year was "Dream Big", something I usually don't have problems doing when it comes to planning the garden! From the garden "bed" to the fairy garden, the displays were fun, colorful and imaginative. This is one of my favorite places to find garden statuary. They have a wonderful selection and it was very tempting with everything on sale for 20% off! But this trip I just enjoyed looking. Fun things to see in the greenhouse and in their store. This is one of my favorite places to find garden statuary. They have a wonderful selection and it was very tempting with everything on sale for 20% off! But this trip I just enjoyed looking at the decorative items and went with the practical such as bird seed and plant twine! Wishing you spring-time weather and happy gardening dreams! 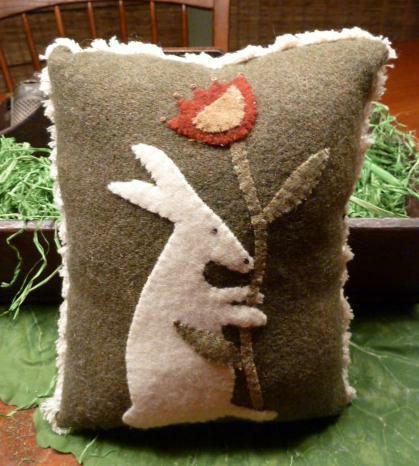 Cute design by Primitive Gatherings. I've stitched it on a piece of vintage flour sack and backed it with a piece from an old quilt. The close-up better represents the actual color of the wool. I have a love-hate relationship with bunnies. It's fun to see them frolicking around the yard, but I'm not happy to find them in my garden. I really get annoyed when they just chew the flowers off plants and leave them in the garden. This guy looks like he really hit the jackpot with this big flower and I love the simple, folky design by A Piece of Work. I'm so pleased with the way this guy turned out. I adapted him from a pattern I've had for probably about 10 years, and I don't know why I didn't make him sooner! 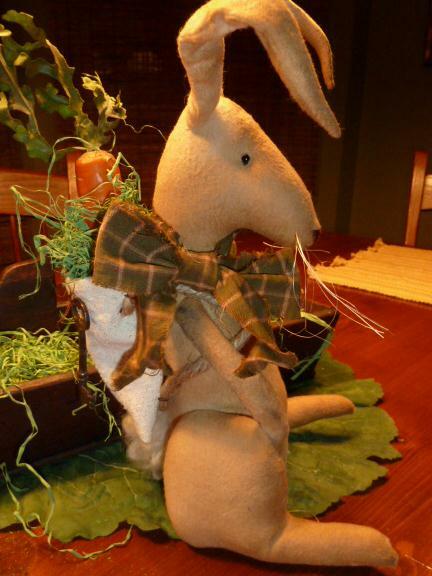 He's made from cotton flannel and heavily tea dyed. Ears and arms are wired so they bend as desired and he has stitched features and fiber whiskers. I've weighted him so he stands a little nicer. Unfortunately, I didn't get his carrot done in time for the photo, but he will come with a painted muslin carrot, not the plastic one pictured! I'm not even sure why I ever purchased a plastic carrot, but it was the right size for the backpack. 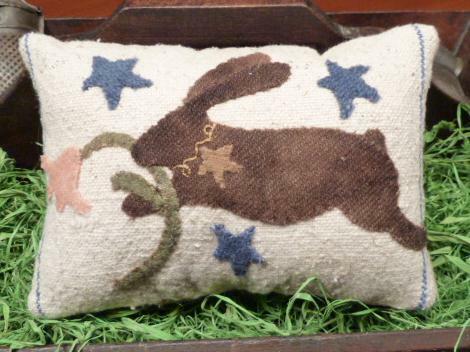 And finally, I have this primitive bunny created from my own design. I think he'd look good on a twiggy wreath or hanging from a cupboard, as pictured, or your front door. Made from muslin that has been painted and hand stitched together. Now, on to finish that carrot. Here in Kansas City we have been teased with a few spring like days and now I'm ready for winter to be over and done with. 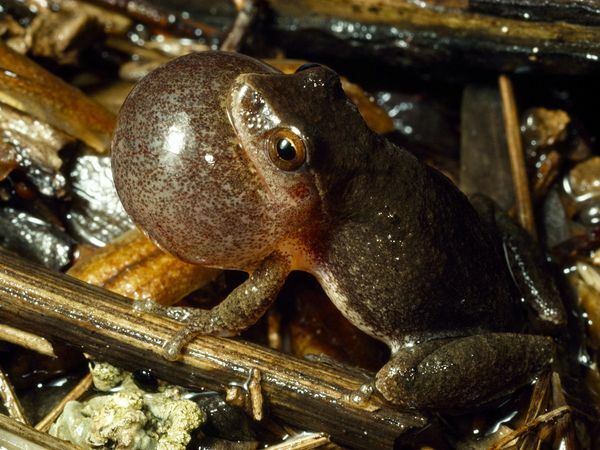 Many of our local garden centers have open houses next week, but recently I was cheered by another harbinger of spring---the lovely sound of spring peepers. Over the past week I've had a couple of night-time meetings at the church. 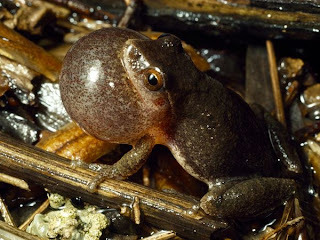 Last week as I walked to my car I thought I heard the faint sound of the little frogs. Last night I parked closer to the pond on the church property and, sure enough, there they were, peeping away even though it was only about 40 degrees outside. I always forget how early in the season they begin, but they are such a welcome sound on these early, dreary days when everything is still brown and it's too wet to work in the yard.